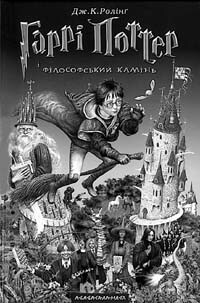 The April 14 action of A-BA-BA-HA-LA-MA-HA Publishers dedicated to publishing first Ukrainian edition of the Harry Potter bestseller gained scale and response perhaps even its organizers did not count on. A lucky idea, without doubt, lays the foundation for a success. The idea to start selling Harry Potter and the Sorcerer’s Stone at midnight on April 13 at Mystetstvo [Arts] Central Bookstore on Khreshchatyk worked perfectly. By the appointed time an impressive crowd of Potter lovers gathered at the doors of the bookstore. In spite of a late hour, there were no fewer children than adults present. On this occasion, the bookstore even changed its address and displayed a signboard reading, Privet Drive 4, the address of Harry Potter’s relatives’ house. The presentation designed according to the laws of a fairy show was hosted by Ivan Malkovych, director of A-BA-BA-HA-LA-MA-HA, along with residents of Hogwarts School of Witchcraft and Wizardry, giant Rubeus Hagrid and Harry Potter himself, played by a rather artistic young man wearing glasses, who later signed books for all comers. There were also Hogwarts faculty members: Professors Dumbledore and Macgonagall, both walking on stilts. However, major hero Harry Potter was proclaimed a little boy from Ivano-Frankivsk, winner of a look-alike contest, who seemed to be slightly dizzy at his good luck. Even popular television host Ihor Slisarenko, who announced the winner’s name, was sporting a Potter-style costume. The end of the show was the beginning of sales of the first book in Joanne Rowling series, Harry Potter and the Sorcerer’s Stone . Probably for the first time in its history Mystetstvo worked at such a late hour, not to mention the number of its visitors. In one hour of night’s sales over a thousand copies of the book were sold; unfortunately, this is usually a decent annual sale for a Ukrainian book. As for the book itself, A-BA-BA-HA-LA-MA-HA is true to itself, doing its work thoroughly. The front cover (incidentally, the publishing house came through a regular war with Warner Brothers Studio for its original layout) was designed by Vladyslav Yerko together with Viktor Baryba, in a technique peculiar to this artist, combining vivid color and precise shading. Viktor Morozov, renowned singer, poet, and musician, did the Ukrainian translation. Obviously, a top team of the publishers’ best forces was involved in the project. Thus, thirteen could turn out to be a lucky number for not only A-BA-BA-HA-LA-MA-HA but also the Ukrainian book market as a whole. For the first time our book publishers have implemented a competent and aggressive strategy of winning their audience, and the latter responded immediately. It is comforting to see such popular demand for a domestically produced book. Certainly, it would be presumptuous to believe that the little wizard wearing round glasses will open a fairy-tale season for Ukrainian book publishing. However, the first move in the game national culture had been constantly losing so far was made, a move both accurate and successful.